UNITED NATIONS, Oct 17 2018 (IPS) - Nikky Haley, the vociferously anti-Palestine US Ambassador to the United Nations, warned member states last year she will “take down names” of those who vote against American interests in the world body—perhaps with the implicit threat of cutting US aid to countries that refuse to play ball with the diplomatically-reckless Trump administration. But that vengeance-driven head count – and no ball playing — could be a tedious exercise for the US when 146 out of 193 member states vote to affirm Palestine as the new chairman of the 134-member Group of 77, the largest single coalition of developing countries at the United Nations. The 146 included some of the strongest Western allies of the US, plus four of the five permanent members of the UN Security Council: UK, France, China and Russia. The only two countries that stood sheepishly by the US were Israel, its traditional client state, and Australia, a newcomer to the ranks of US supporters. The 15 abstentions included some of the usual suspects: Austria, Andorra, Bosnia-Herzegovina, Bulgaria, Canada, Croatia, Czech Republic, Honduras, Hungary, Latvia, Lithuania, Monaco, Poland, Slovakia and Tuvalu. The vote in the General Assembly on October 16 was, by all accounts, a humiliating defeat to the Trump administration which moved the US embassy from Tel Aviv to Jerusalem and cut $300 million from its contributions to the UN Relief and Works Agency (UNRWA) aiding Palestinian refugees. Both were decisions aimed at undermining Palestine at the United Nations. But the Palestinians pulled off a major victory despite the behind-the-scenes lobbying both by the US and Israel to thwart the Palestinians. Palestine, which is a non-member state, was endorsed as the chairman of the Group of 77, beginning January next year, at a ministerial meeting late September. The General Assembly vote was a ratification of that decision. Mouin Rabbani, Resident Senior Fellow at the Institute for Palestine Studies at Washington DC, told IPS the election of Palestine as the new Chairman of the Group of 77, particularly given the overwhelmingly lopsided nature of the vote, can only be interpreted as a pre-meditated and deliberate slap in the face to the United States by the international community. Last month the civilized world audibly laughed at Trump as he engaged in another boorish display of Americana at the General Assembly, he added. “Today it demonstrated that its response to the determination of the United States to dismantle the international system and its institutions, eliminate the concept of accountability under international law, make US power the sole arbiter of international affairs, and use the Question of Palestine as the vehicle of choice for achieving these objectives, can also take more serious forms”. Following the vote, Haley said the United States voted against the resolution granting the Palestinians privileges at the United Nations as chair of the “Group of 77” – a coalition of developing Member States at the UN. The U.S. strongly opposes the Palestinian election as Chair of the G77, as well as the so-called enabling resolution in the UN General Assembly, added the outgoing envoy, who announced last week that she will resign her post by the end of the year. 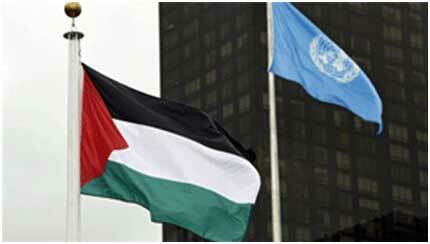 “The Palestinians are not a UN Member State or any state at all. The United States will continually point that out in our remarks at UN events led by the Palestinians. “Today’s UN mistake undermines the prospects for peace by encouraging the illusion held by some Palestinian leaders that they can advance their goals without direct peace negotiations. In fact, today’s vote does nothing to help the Palestinian people,” said Haley. The Palestinian ambassador Riyad Mansour said the General Assembly vote represents multilateralism at its best, with the wider membership supporting a resolution to enable the elected Chair of a group to perform its duties effectively. He said it was an expression of respect for the decision of the Group of 77 and China to elect the State of Palestine as its chair for the year 2019 by consensus, following the endorsement by the Asia-Pacific group of the State of Palestine’s candidature, also by consensus. “The State of Palestine will spare no effort to prove worthy of this trust in its capacity to represent and defend the interests of the Group of 77 and China, while also engaging constructively, and in an inclusive and transparent manner, with all partners, in order to advance cooperation and mutually beneficial agreements, for the common good of all humanity,” he added. The General Assembly resolution not only ratified the ministerial decision but also provided Palestine with additional rights and privileges, including the right to make statements on behalf of the Group of 77 and China, including among representatives of major groups; the right to submit proposals and amendments and introduce them on behalf of the Group of 77 and China and the right to co-sponsor proposals and amendments. Additionally, Palestine has been given the right to make explanations of vote on behalf of the States Members of the United Nations that are members of the Group of 77 and China; the right of reply regarding positions of the Group of 77 and China; and the right to raise procedural motions, including points of order and requests to put proposals to the vote, on behalf of the Group of 77 and China. Rabbani said the election of Palestine to lead the Group of 77 should be seen as a direct response to the US recognition of exclusive Israeli sovereignty over Jerusalem in flagrant violation of numerous UNSC resolutions, the termination of US funding to UNRWA as part of a campaign to redefine Palestinian refugees out of existence, punitive measures taken against the Palestinian civilian population of the occupied territories to dissuade the Palestinians from pursuing claims against Israel at the International Criminal Court (ICC) and the International Court of Justice (ICJ), and further measures to legitimize perpetual Israeli control over the Palestinian people, their territory, and resources. “If this was a traditional election for the Chairmanship of the Group of 77 it is questionable whether Palestine would have been nominated, highly unlikely it would have won, and virtually out of the question it would have achieved the result it did. In other words, this was about issues much larger than the managerial qualifications of the successful candidate, and above all a political message directed at Washington,” Rabbani declared. The vast majority of Group of 77 members have gotten in line to ask Nikki Haley, and by extension the “hidden genius”, Jared Von Metternich, to take down their names and note that they categorically reject US policy on Palestine and on the broader objectives the Trump administration is seeking to achieve, he said. “The greater challenge is to translate these symbolic victories, important as they may be, into substantive achievements,” he declared. I’m very very pleased for Palistine they deserve so much more while the US and Israel deserve so much less…The Lord our God sees all..